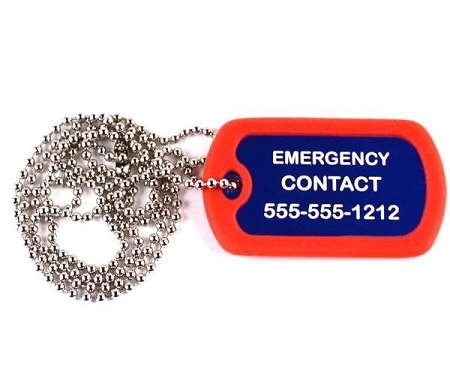 Tags are anodized aluminum and laser engraved for great visibility. 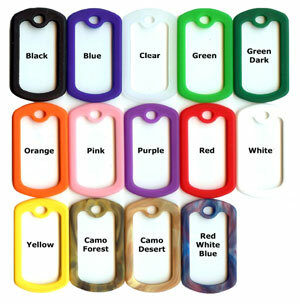 These medical identification dog tags and keychains are a wonderful alternative to traditional medical ID jewelry. 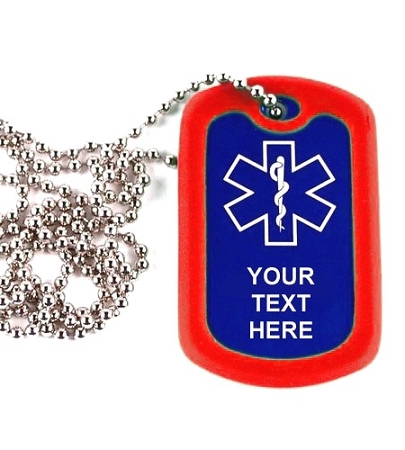 Prominently displaying the medical alert symbol on the front, they come in a wide range of colors and can be used as a keychain or necklace. The back can even be engraved with contact information. Protect your friends and loved ones today! 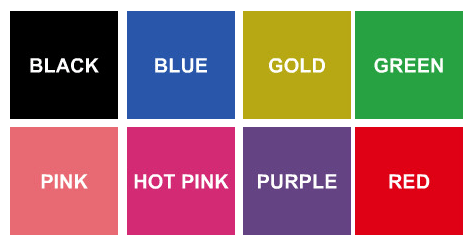 Choose a tag color and a silencer to protect your tag and keep it looking brand new for years. My husband has dementia and is in a dementia unit. I purchased these tags for him to always have on should he ever manage to walk out of the hospital as he would have no idea of his name or where he lived. I am pleased with them. The wording is very clear. They give me peace of mind. I am very pleased. It came promptly, and as advertised. I've been wearing it around the neck as designed, and have had no problems at all keeping the 'jingle protector' in excellent condition. I was very pleased with the product I ordered. I got 4 medical alert dog tags to carry on different items. I also got the silencer's. The engraving is clear & easy to read, nice variety of colors to select from and the personal service via email was great. Thank you all!!!! I bought the tag from my reward points. I really like it except the rubber 'jingle' protector broke the first week I had it. It would not stay on, maybe because I put it on my keychain. The picture in the advertisement looks like it is leather vs metal.